What do you do when your husband of 30 years decides his poetic gifts may be of service in the reconciliation needs of Ireland? You say "sure honey, when are we going?" After all, it was my idea that he might enjoy seminary. I love to travel, and he had supported every step of my career so I figured it was his turn. Little did I know this "call"� would take seven years to materialize. This discussion happened in 2000 shortly after Ward started seminary education and rediscovered his poetic gift. He had felt the "call"� even earlier, heartbroken by the continuous conflict in Ireland, and then all things Irish kept appearing in our life in the Bay Area, and even bumping into the Irish Prime Minister while on a trip to Guangzhou, China. The Stothers name is Protestant from Armagh in Northern Ireland and Ward's mother's family were Irish Catholics from Wexford in the south. We made a family heritage tour of Ireland in 2000. Ward went on the 10th PCNI Irish Summer Institute for Peace in Northern Ireland in 2004. We returned in 2005, 2006, and 2007 to pursue job leads. Death of parents, retirement from government employment, and three surgeries for Ward prolonged our transition. The time and position has now come and we are leaving the country on April 15th assuming entry clearances are received. We are joining Crumlin Road Presbyterian Church in the Greater Shankill area of Belfast. Ward will be a pastoral assistant and I will be the pastoral assistant's wife until I ground myself and determine what else I can do. The Greater Shankill area is the heart of the Protestant stronghold. The area has lost population since the '60s from 70,000 to 15,000. Every family was affected by the Troubles. The Crumlin ward is the most impoverished in all of Northern Ireland according to a 2004 government study. The senior pastor grew up in this neighborhood and has been at the church for five years. He said people need to move back here and build the community. He serves the church of 220 families of which only 60 attend worship so he has to visit the others. He serves the community as chairman of the board for the Vine Community Center, and he serves the community as a leader working with other pastors and priests. Pastor Jack's wife is a chartered mechanical engineer, working 32 hours per week. We will join the pastoral team and come alongside the people. Ward will do visiting, teaching, and some preaching, and I plan to do community work. We are looking forward to working with the Drennans. Our recent preparation includes designing and posting a website quonstothers.com. It is a place to post Ward's writing, and to develop the QSA consulting practice. Take a look. I need friends to keep in contact with me. We also need prayer and financial support, (which is tax deductible to you), for the church/community work, (www.cten.org). A few of you are already on our mailing list. If you haven't received a mailing, and are interested in keeping up with us, please Marda email me with your address. I will miss seeing all of you. I hope some of you will call and visit with us in Ireland, the UK, or Europe. Gregory J. Hannah, MBA, CFP talked to OWA members on February 5, at the PG&E Energy Center, San Francisco. Gregory Hannah began by saying that where finances are concerned there are two types of people, Spenders and Savers. He went on to say many people put off saving for their retirement and then are unprepared when they are ready to retire. He asked, "Do you spend more time planning your two week vacation than you do your retirement?" He advised that in order to be prepared, one first needs to figure out one's goals and priorities, then develop a financial planning strategy, create a budget, and start an investment portfolio that is geared towards one's risk tolerance and your needs. Mr. Hannah further declared that individuals desire to retire early and because of advances in health care may live well into their nineties and beyond. The quality of life in these elder years is so enhanced that the level of activity is reflective of a much younger person. The assets designated for retirement are often times not sufficient for the longer lives and lifestyles of today retirees. No one wants to outlive their money. To further complicate this issue, it is common knowledge that social security will not be adequate for the next generation of retirees. Financial planning for the future requires a complete analysis that includes debt to income ratio, budgeting, and investment possibilities. He continued to advise that the strategy for retirement, college planning, estate planning, and/or legacy planning all begin with your priorities and goals. A financial planner can help develop an investment portfolio with a balanced assortment of financial products to safeguard your money and allow it to grow. According to Mr. Hannah, a balanced mix of financial products and a well-chosen combination of risk levels is crucial. You should plan your asset allocations with a mix of stocks, bonds, and cash that are a match to an individual's risk tolerance and good financial sense. In Mr. Hannah's view, small company and international stock funds, options, and commodities can have huge gains, but are also extremely volatile. International investments with the fastest growth such as BRIC (Brazil, Russia, India and China), gained 60% last year, but carries significant risk. Middle risk investments such as annuities, stocks, and real estate, with real estate being historically riskier than the stock market are the next level of risk. Large company stock funds, corporate bond funds, government bond funds, money market funds and CDs are good products for those with low risk tolerance, however the returns are lower. A good balanced mix of the three tiers of investments in alignment with the individuals risk tolerance will buffer your investments as well as secure growth. Mr. Hannah advises that life insurance can be an estate plan; the money is there when we need it by taking cash from the policy. He also heartily advises us to invest in a Long Term Health Care plan, saying, " Don' t wait to get it or you may not qualify when you need it"�. This insurance can cover a significant portion of home care or nursing home patient care. Mr. Hannah illustrated the importance of having such insurance with his personal story of a potentially debilitating stroke that occurred at a relatively young age. He was lucky enough to have recently purchased a Long Term Health Care plan right before his stroke. It helped to cover the extensive medical care he required. Many who have diligently saved for retirement have lost it to such circumstances. That is enough of a warning for me and I am looking into buying mine now. A Long Term Care plan is one way to prepare for the unforeseen. Among the reasons people do not save enough money to retire are a lack of planning, inflation, loss of income to taxes and poor investment choices. Mr. Hannah would like to help us plan and save enough for our future. He points out that Certified Financial Planners are responsible for what they tell you, while brokers are not legally responsible for their advice. Some retirement options to help save for our future are to live on less now, save more, delay the day we retire according to our priorities and earn more money now. Inflation averages about 4% per year, so your money must earn 4% interest per year just to keep up. At this rate, a cup of coffee will cost $16 in 2024! When looking at retirement needs, inflation is the most important factor to consider. Mr. Hannah points out that if you take full Social Security benefits at age sixty-six, there is no taxation on additional income. In addition to giving this informative presentation, he has kindly offered to meet with OWA members for one hour, pro bono to give us financial planning advice. Feel free to call him and set up an appointment - Gregory J. Hannah (510) 568-4652. 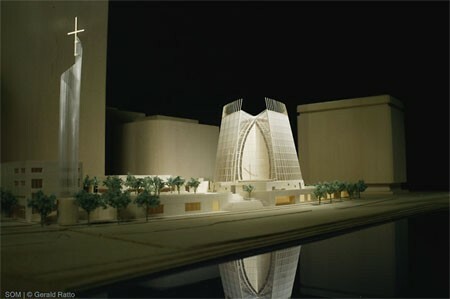 The City of Oakland's Cathedral of Christ the Light will resonate as a place of worship and instill a sense of solace, spiritual renewal and respite from the secular world - it will be a sanctuary in the broadest sense of the word. Comprised of a 1,500-seat sanctuary with side chapels, a baptistery and dependencies, the Cathedral will honor its religious and civic obligations to both the Catholic Diocese and the City. With a building form based on an inner wooden vessel contained within a veil of glass - both of which are anchored on a sculptural concrete "Reliquary Wall" - the design is meant to convey an inclusive statement of welcome and openness as the community's symbolic soul. Craig W. Hartman, FAIA, is partner in charge of design for the San Francisco office of Skidmore, Owings & Merrill LLP. His work in the United States, Europe, and Asia ranges from entire urban districts to singular works of commercial, civic, and cultural architecture and is consistently sympathetic to issues of contemporary place and time as well as the sustainability of urban and natural ecologies. Hartman's projects, such as Oakland's Cathedral of Christ the Light, the U.S. Embassy in Beijing, Harvard University's Northwest Science Center and San Francisco's International Terminal, St. Regis Museum Tower, 101 Second Street and Treasure Island have been frequently included in international publications and exhibitions. His work has been recognized with over 60 awards for design which, in addition to a Gold LEED Certification, includes American Institute of Architecture awards for environmental sustainability at Treasure Island and the University of California, Merced. He has been an invited critic and visiting faculty member at several schools of architecture, and lectures internationally. In 2001, he became the youngest recipient of the Maybeck Award, an award presented periodically by the California Chapter of the AIA to an individual in recognition of "lifetime achievement in architectural design." The Steering Committee continues to evolve as our members follow their dreams to new endeavors. Marda Stothers will be leaving presently for Northern Ireland and Darlene Jang will be taking her place on the Steering Committee. Many of you know Darlene from her previous service to OWA nevertheless here is a formal introduction and background on her. Our warmest welcome to you Darlene. Upon graduation from UC Berkeley to internships, Darlene Jang co-found her San Francisco design studio Barcelon & Jang focusing on gallery architecture, educational facilities and housing. After completing several galleries, she competed in a major design charette for her first museum commission, the Triton Museum of Art in Santa Clara, CA. This museum commission launched her firm's reputation in museum design. Her practice evolved to adaptive reuse and renovation with the historic Julia Morgan YWCA Building in San Francisco for the Chinese American Historical Society Museum and the new "green" designed Pence Gallery in Davis, CA. She is currently working on a new art center in San Luis Obispo, custom "green" homes and affordable housing employing sustainable design methodologies. Her firm has been recognized through numerous honors, awards and publications. She continues to explore future design direction in not only hybridization of art and architecture, but also in the complexities of tradition in an industrialized urban context. The XVI Pan-American Biennale of Architecture, Quito, Ecuador BAQ 2008 invites all design professionals to participate in this international conference and design competition. This Biennale theme is â€œFeeling the Latin-American Architectureâ€�. The BAQ 2008 will take place in Quito, Ecuador, one of the cities nominated by UNESCO as a World's Heritage. The event will take place from November 17 to November 21, 2008. The Biennale includes Pan-American and International Design Competitions, a Symposium, Conferences, Architectural, and Art Exhibits through out the City, and other complementary activities. The goal of BAQ 2008 is to achieve a great participation of international professional achievements, with the highest level of design and professional standards, including sustainable and universal design. There are several categories in which you can participate sending built projects completed during the last four years to enter the international design competition. The deadline for submittals is September 8, 2008. All projects submitted will be published in the book, BAQ 2008. If you are interested in participating in the design competition or any of the events offered at XVI BAQ 2008 please go to the Biennale's web page and also contact Gilda Puente-Peters, U.S. Coordinator via email. From the back room at the Sennelier art store on the banks of the Seine, to the cave paintings of the Dordogne, experience a French culture through the eyes of a painter. The tour includes a three nights on the left bank in Paris, three in Bordeaux, and four in the countryside of Bergerac. Open your eyes to the particular nature of French sensations-- the city, the landscape, the light, the food, the wine, and the paceâ€”and refract that experience into your painting. Requirements: jpeg, horizontal format, ±1200 pixels wide by ± 800 pixels high, project title and location, your role in the project, firm name, website link if appropriate.